"We have received. 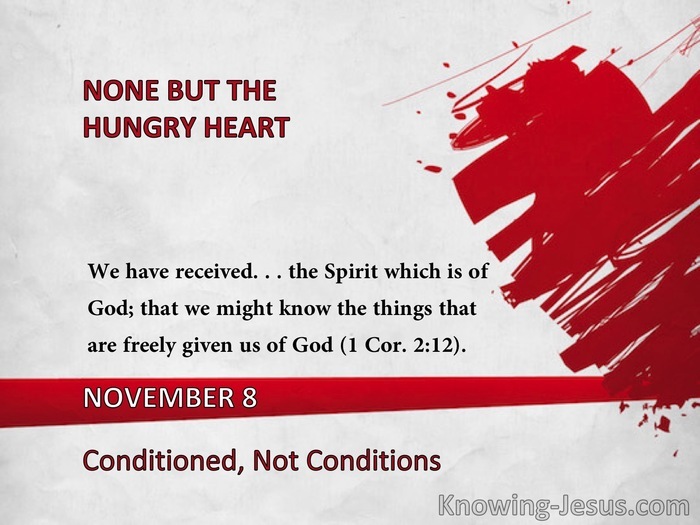 . . the Spirit which is of God; that we might know the things that are freely given us of God" (1 Cor. 2:12). The Spirit's ministry is to present a Person, rather than to produce an experience. "Where man calls for conditions, God calls for the Cross. As the finished work of the Cross is applied to the life by the Holy Spirit, thereby progressively holding the old man in the position of death, the believer is conditioned for the Spirit's fulness. It is not a surrendered self, but a crucified self that gives the Spirit freedom in the life. "The sixth of Romans comes before the twelfth. In the latter we have the surrender, but it is not to get, or to attain; it is because he has entered into what is his; he has accepted the wondrous fact of his death with the Lord Jesus, and of the Spirit's presence and ministry. A crucified man relies upon no experience. To him the Lord Jesus is his very life." -S.R. "Whether it be for the initial revelation to our hearts of divine things, or amid the discipline that must follow ere those divine truths become a part of us, we shall find it necessary to turn again and again to this gracious comforter of our infirmities. "It is by His revelation through the Word that we behold spiritual realities; it is by His loving discipline that we enter into those realities. By the former, He opens the gateway to progress; by the latter, He leads us on in the pathway of growth. The former is foundation, the latter is the temple. Without His scriptural revelation we cannot commence the course, but without the discipline of His ministry we cannot complete it. Both these aspects of the Spirit's work are equally essential, and for both we can assuredly count upon Him." "The spirit of truth... will lead you into all truth" (John 16:13).